We can make curved glass, etched glass, color etched glass, stainless steel cables, Iron, Wrought Iron to be either traditional or contemporary. If you can imagine it we can make it. We can use aluminum rail, wrought iron rail, glass rail, steel rail, and other materials. Railings are made out of aluminum, wrought Iron, stainless steel or brass. Wrought Iron can be weather proofed with a zinc coating to prolong the life. Aluminum does not rust. Stainless steel stains less. There is sometimes a little bit of browning. Brass turns green (tarnishes). You can treat it with clear coat bit if it gets scratched. Durability – It is important to use materials that will withstand the pressures and weight that railings are subject to. Railings are safety features to prevent people from falling. They also provide a sturdy grip for people when they walk down the stairs. 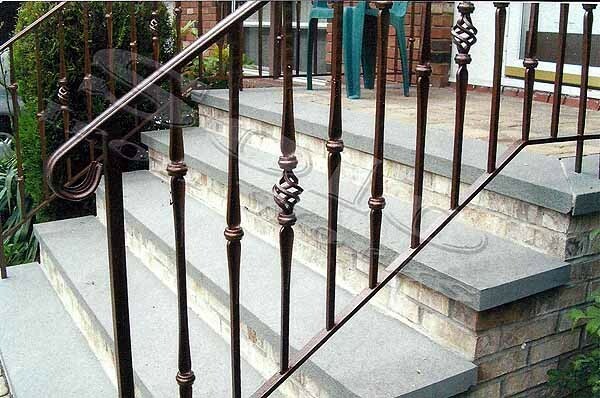 Metal is an excellent and popular railing materials. Metals include Steel, Wrought Iron, Stainless Steel, Brass, and Aluminum. There are many grades, variations, combinations and finishes that can be used to make your railing unique and attractive. Materials and Maintenance – Certain materials are more maintenance free then others. Iron and steel could rust if it is not protected and maintained. Aluminum tends to be more maintenance free and brass will tarnish and requires constant polishing. Stainless steel stains less but tends to be more expensive. Steel can also be metalized with zinc to help it last longer.